DIRECT FROM LOURDES - Elegant Fidei 3 Decade White Rosary�Necklace. Elegant Fidei 3 Decade White Rosary�Necklace. 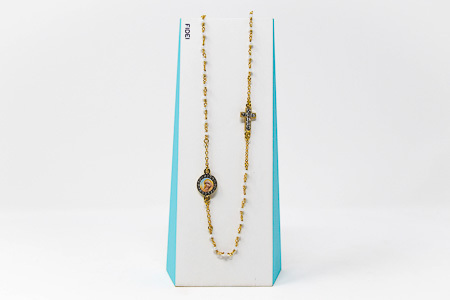 Elegant Fidei gold pated rosary necklace with a clasp and white crystal beads. The round medal depicts Mary and Jesus with encrusted strass crystals surrounding the medal. The cross is also encrusted with strass crystals. The base metal for this bracelet is palladium, which is a rare metal of the platinum group that does not oxidize. This rosary is hypoallergenic and nickel free. Length of necklace is 26 cm 10.2 inches closed and 52 cm 20.4 inches open approx.